About two and a half years ago, I brought my mom's dog, Boo, home to live with me. And on Saturday I said goodbye to her. I wasn't expecting to say goodbye so soon. On Wednesday, Boo was fine. Greeted me when I came in the door from work. Monitored the squirrel activity in the backyard and then laid in a patch of fall sun on the deck. Ate dinner. Sat next to me while I did schoolwork. On Thursday, she stopped eating. Was acting kind of lethargic. On Friday, I called the vet and made an appointment. I wasn't too worried. She had just had her shots and and a senior wellness check up right before I went back to school in August. At the time, the vet said her blood work was perfect. Her appointment was at 9:30 on Saturday. The vet checked her out. Couldn't find any visible problems. Wanted to redo the blood work. Sent us home. Called me an hour later. "You have a very sick dog." Her liver values, which had been normal a month ago, were ten times the normal limits. She wanted me to take her to the emergency clinic for more tests. And so we went. The vet was young. So young. And very sweet. Wanted to do an abdominal ultrasound. Four hours later he had an answer for me. A gall stone had traveled from Boo's gall bladder and lodged in a valve in her liver. Surgery would cost $8000 to $10,000. And would be very risky. She probably wouldn't survive. And so they took me down the hall to the "Comfort Lounge." Brought Boo to me. I said goodbye. Held her and rubbed behind her ear, her favorite spot, while they put her down. And about all I can say is that Boo lived life on her own terms. And that she was as brave as she could be. Boo had a very hard life. She was a puppy mill mama for the first six years of her life. Lived in a wire cage. Had litter after litter after litter after litter of puppies. Was abused, probably, given her fear of my boys, by a man. She was finally saved by the National Mill Dog Rescue, then adopted by my mom. When my mom's living situation changed two and a half years ago, I brought her home to live with me. Every single thing she did was an act of bravery. It was brave for her to move beyond the confines of her bed in the corner of my living room. It was brave for her to initiate eye contact with me. It was brave for her to allow my granddaughter, Esveidy, to stroke her ears. It was brave for her to ride in the car with me. Or to allow the vet to touch her. Boo lived the last three years of her life bravely. Rest in peace, my brave girl. Rest in peace. I have been trying to read WISH since about March. It wasn't out then, but people in Children's lit world, were reading ARC's and talking about it. I kept trying to get hold of a copy- wishing someone would send me one, entering drawings on the web, begging pretty much shamelessly. I knew I would love the book. I love Barbara O'Connor's books. HOW TO STEAL A DOG is pretty much one of my all time favorites. In fact, I hardly ever read a book, at least a chapter book, more than once to classes. But I've read that one at least five times. And it's sitting on the chalk rail at school waiting for me to read again on Monday. I love the big truths in that novel. Love how it brings classes, even the world's squirreliest kids, into a community that cares about books, and more importantly, that cares about each other. 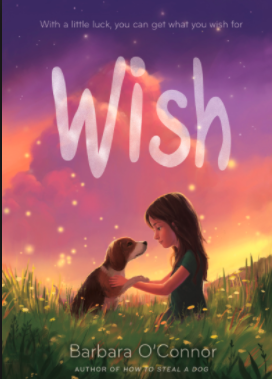 So I couldn't wait to read WISH. But I didn't win a copy. And so I had to wait. And wait. And wait. It finally came out a few weeks ago. And of course, even though I am not supposed to be spending money, and especially not on books, I had to run right over to Tattered Cover and buy it. And of course, I loved it. I loved the main character, Charlemagne Reese, better known as Charlie. When the book opens, Charlie has just moved to Colby, a small town in the mountains of North Carolina, to live with her Aunt Bertha and Uncle Gus. Charlie's father, Scrappy, is in jail and her mother won't get out of bed in the morning. On her first day in her new school, Charlie fills out a "Getting to Know You" survey. She describes her three favorite activities as soccer, ballet, and fighting. I loved the characters that surround Charlie. Aunt Bertha and Uncle Gus haven't quite figured out the parenting thing. Charlie's room is filled with an old tv and canning jars stacked against the wall. Aunt Bertha talks a blue streak and has seven cats. She buys Cinderella pillowcases and a rainbow and pony lunch box and she puts slightly burnt cookies in Charlie's lunch. And then there's Howard Odom, the boy who has red hair and ugly black glasses and walks with an up-down limp. He becomes Charlie's best friend and teaches her to say "pineapple" instead of slugging someone when she gets mad. He helps her to capture and adopt a stray dog named Wishbone. He forgives her when she is mean to him. WISH is a story of brokenness. And friendship. And love. And healing. I think you should read it. You will probably love it. I know I did.